You like strategy games, management and war games? Goodgame Empire is for you! This free massively multiplayer online game (MMORTS), in English, can be played online on your PC or laptop, directly from your browser (no download required). The game takes you a few centuries back, in the middle ages, when knights were not only good to defend their fortress, but also to conquer lands in a quest to become powerful and respected. With a rich community of more than 80 million players, rapidly growing, Goodgame Empire is one of the most popular Empire games in the world! This is both a strategy game with real-time management and an action game in which you will manage as much the military aspect as the social, logistical and economic sides. The purpose of this medieval game is simple; you will become the lord of a castle and build your humble fortress so that it becomes an immense kingdom. Form partnerships and coalitions and create armies for intense battles (player against player) in a dynamic world map... If the goal seems simple, the task will be difficult unless a great strategist capable of creating alliances to achieve his or her goals leads the attack. To impose your supremacy and expand your kingdom, you will have to grow on an economic plan with your firm, stone quarries, lumber camps and win additional funds. 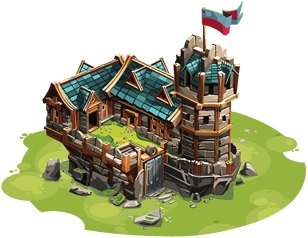 Through these means, you will manage and build your own economic system with the currency of rubies! There are also locations for you to conquer without the support of a great army. You must be able to defend your fortress against your many ruthless enemies who are willing to do anything to prevent you from reaching your ultimate goal, which is to conquer more land; castle after castle you will build your kingdom as ruler of the most powerful empire. To achieve this, you will need to forge secret alliances to develop and assemble your army, expand your territory and conquer the world. You can create your alliance with rubies or join an alliance with another player if prompted, and you can choose to make your empire defensive or offensive. In this free game, there are many tricks allowed like sending spies to a castle of another player or a rascal to get vital information on its resources, army size, plans, strategies, defenses and the position of the soldiers. As you level, you will have access to more and more unique strategies. And from level 7, you will be able to build your taverns to recruit spies. The more spies you have, the more accurate the information and your spies will run less of a risk of being caught. This medieval browser game, playable for free, is a real conquest game where strategy, reflection, cunning and fierce battles are abundant, satisfying both fans of war games - where fighting rages - and players who like to reflect and build their virtual world step by step, patiently and intelligently. With a similar approach and game play to other war games or strategy games such as Grepolis, Forge of Empire (FOE) or Age of Empires, Goodgame Empire will not disappoint gamers accustomed to medieval online RPGs. The design of the game has striking realism, which will plunge you into a medieval world where the attention to detail will make you almost forget you're in the 21st century. Finally, the main reason to play this game is to play with others. By inviting your friends to join with a simple click to create party feature, it will keep you entertained for a long.